Last week I was hungry for rice and today is Fat Tuesday (I connect this recipe with Mardi Gras but I can’t put my finger on why). My hunger for rice happens a few times a month -I love rice. You can put almost anything on it and have a meal. Steam yourself a large amount over the weekend or on Monday, add a topping (pesto, chutney, cheese or what I’m about to share, some tuna or salmon) and no worries about meals. 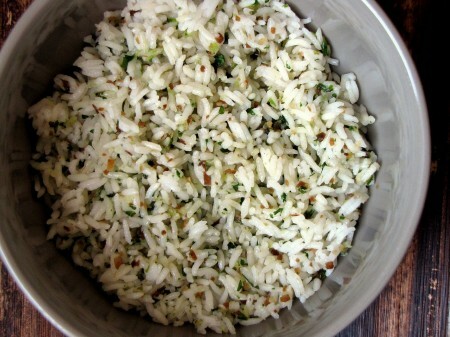 This toasted coconut cilantro rice recipe comes from weheartfood.com. I changed just a few amounts of ingredients and a method or two. I think pineapple, maybe some mango, would be great on the side. I served it with a roasted salmon fillet for the two of us but black beans with some cumin would be great as well- we were sitting happy. So sit happy after an easy, short amount of time in the kitchen with this one. Soak rice in cold water for 30 minutes, and then drain well in a sieve. In a large skillet, toast coconut over low/medium heat until golden brown. It will burn rather quickly so keep an eye on it. Remove from the skillet and set aside. In the same skillet, add 1 tsp of the oil over medium heat. Cook ginger and jalapeno for a few minutes, then add the rice, stirring for a few minutes. Stir in 1 cup of water (just so the rice is covered-might take more) and salt. Bring to a boil, covered. Reduce the heat to low and cook covered for 10 minutes, then take the cover off and cook until the water is absorbed. Remove from the heat and let stand for 5 minutes. Fluff with a fork after this. 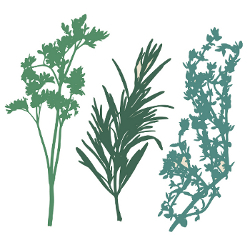 While allowing the rice to stand, pulse coconut, cilantro, scallions, salt/pepper and the remaining 2 tsp of oil in a food processor until combined. Fluff this mixture into the rice. I think pineapple, maybe some mango, would be great on the side. I served it with a roasted salmon fillet but black beans with some cumin (or Salsa Lizano) would be great too. I’ve been looking for a good recipe for coconut rice and this sounds like one I would love. Can’t wait to try it!